Did you know that the duPont Manual PTSA awards several scholarships each May? Up to four one-time gifts of $600 each are awarded to seniors who are continuing their education at the college level. To be eligible for these scholarships, students must be a member of the PTSA, and complete an application that will be posted here. The deadline is typically in March and recipients are notified in May. Additionally, up to one No Barriers scholarship will be awarded by the PTSA to a Senior in the ECE program. This one-time $600 award may be used for continuing education, vocational training, or steps toward independent living. The application deadline is also in March. For more information and the application, please contact the ECE teachers. See the latest scholarships news. 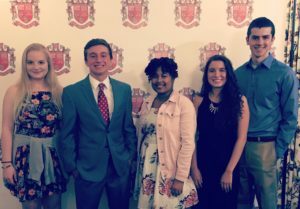 Congrats to our 2018 scholarship award winners Johanna Murray, Ryan Kline, Trinity Wilson, Catalina Mansilla, and Greg Schwartz! In 2015, the Manual PTSA reviewed our scholarship program and found that it had been years since we updated the application process or increased the funding. So, thanks to everyone who joined the PTSA and donated to the budget we were able to, under the leadership of the PTSA Board (most especially Scholarship Chairs Denise Mallett and Judith Bradley), simplify our application process and make it digital; increase our scholarship budget from $1,000 to $3,000; and increase the number of scholarships from two to five, including the addition of a “No Barriers” Scholarship for a student who has overcome significant obstacles. We are thrilled to have honored 5 new Manual scholars at each annual Manual Scholarship Reception since then. Click on the links below to see other PTA Scholarship Opportunities!